Colin Kaepernick is carrying on the legacy of Muhammed Ali, according to the Ali family and Sports Illustrated. The quarterback has received the 2017 Sports Illustrated Muhammad Ali Legacy Award, an honor awarded annually to athletes who demonstrate "the ideals of sportsmanship, leadership and philanthropy" and who use "sports as a platform for changing the world." "There will never be another Ali, but few athletes have followed his example as fully as Colin Kaepernick," said SI Executive Editor Stephen Cannella. Kaepernick, who hasn't played in 2017, famously kneeled during the singing of the National Anthem before a 2016 pre-season game as a form of protest for the treatment of black Americans, particularly by police. While his decision to protest has brought more awareness to racial inequality in the U.S. and gained support from many NFL players, he's received a heavy dose of criticism from people who believe he's disrespecting the flag, military and police. President Trump in September fanned the flames by stoking criticism of the protests, saying that any player who kneels should be fired. Ali, who died in June 2016 at the age of 74, is still one of the most notable and popular U.S. athletes. But, he wasn't always a favorite. In 1967, Ali was a conscientious objector to the Vietnam War and refused to serve in the army. He was stripped of his world title, and lost his license to box. He was also fined $10,000 and sentenced to five years in prison. He was heavily criticized and seen by many as a draft dodger. He famously defended his decision by saying he couldn't fight against a people who had never wronged him. Like Ali, Kaepernick has been severely criticized. He's also faced consequences for his actions. Ali didn't return to professional boxing until 1970 -- missing out on three years during a peak time in his career. Kaepernick has lost nearly a year of playing time -- he has yet to be signed by a team since opting out of his contract with the 49ers in March. In bestowing the honor, Sports Illustrated praised Kaepernick's "steadfastness in the fight for social justice" and his "adherence to his beliefs no matter the cost." The article noted that both Ali and Kaepernick "sacrificed for the greater good at a time when many Americans could not see it was a greater good." Sports Illustrated consults with Ali's widow, Lonnie Ali, to pick the recipient. She said she was "proud" to present Kaepernick with the award. "Like Muhammad, Colin is a man who stands on his convictions with confidence and courage, undaunted by the personal sacrifices he has had to make to have his message heard. And he has used his celebrity and philanthropy to benefit some of our most vulnerable community members." The legacy award has been handed out since 2008 but was renamed after Ali in 2015. Past recipients include Eunice Kennedy Shriver, who founded the Special Olympics, Magic Johnson and Jack Nicklaus. Last year's award was shared by Kareem Abdul-Jabbar, Jim Brown and Bill Russell. 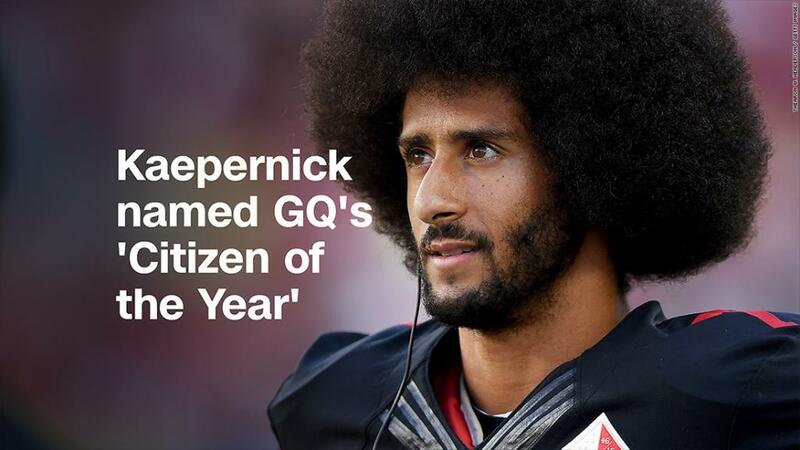 Kaepernick was also recently named GQ's "Citizen of the Year."